Happy St. Patrick’s day! 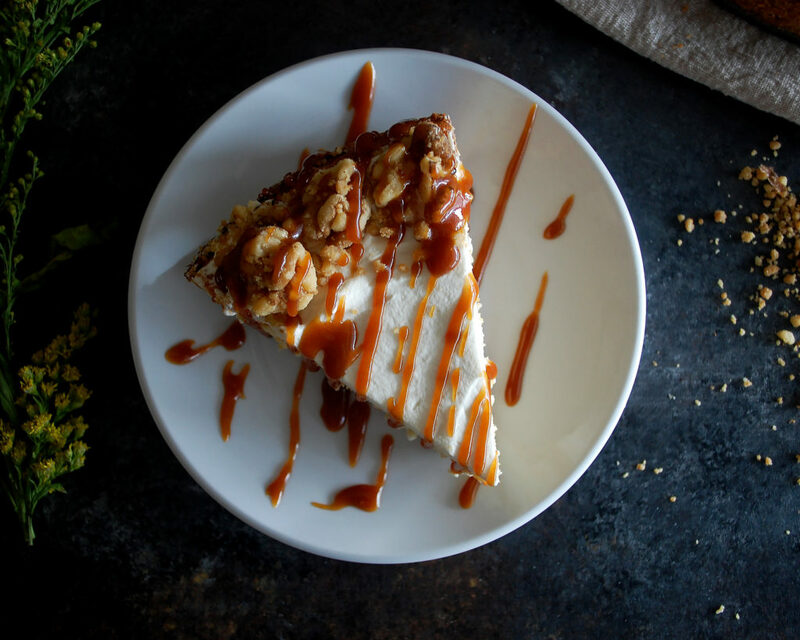 There’s no better way to celebrate than with a big slice of Irish cream cheesecake, topped with a thin layer of Irish whipped cream and silky caramel…PLUS the most amazing walnut streusel crust. For the longest time, I’ve been hearing how amazing my Nana’s cheesecake is. My dad has been insisting I make it, so I finally found the perfect occasion. I wanted to do some sort of dessert for St. Patrick’s day using Bailey’s Irish Cream. 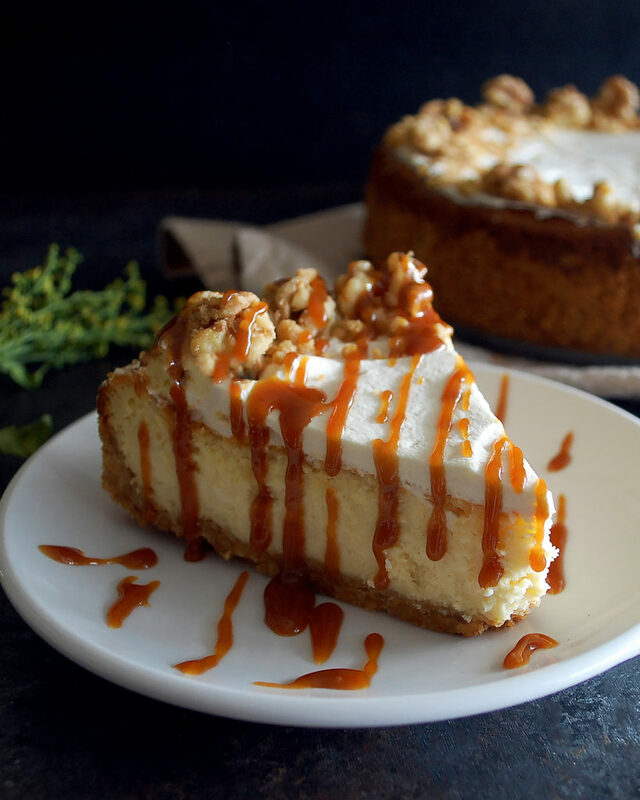 The smooth texture and sweet taste just sounded perfect for incorporating into the cheesecake. 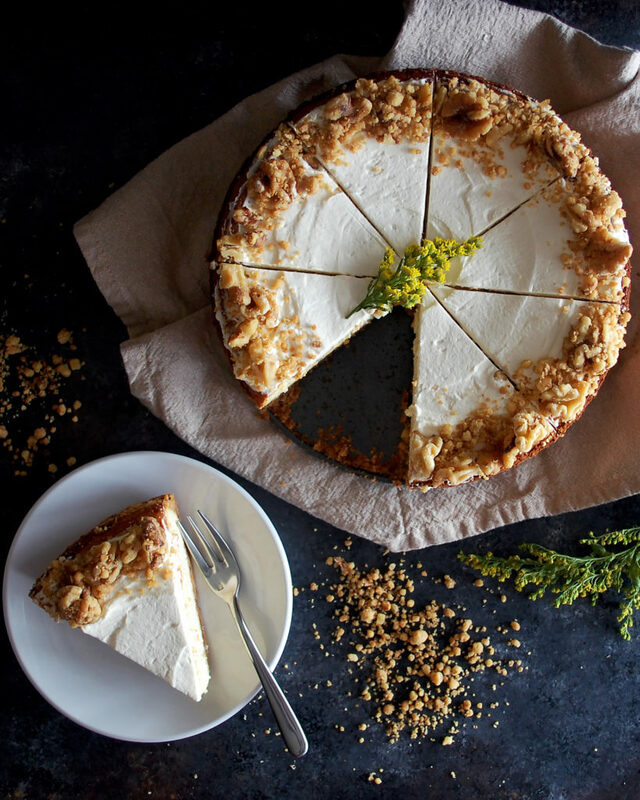 Now this cheesecake isn’t quite like the traditional New York cheesecake we are used to. But let me tell you…this recipe will become your new favorite. It is SO simple to make. And has such a unique taste and texture. And the crust! It is one of the best things. 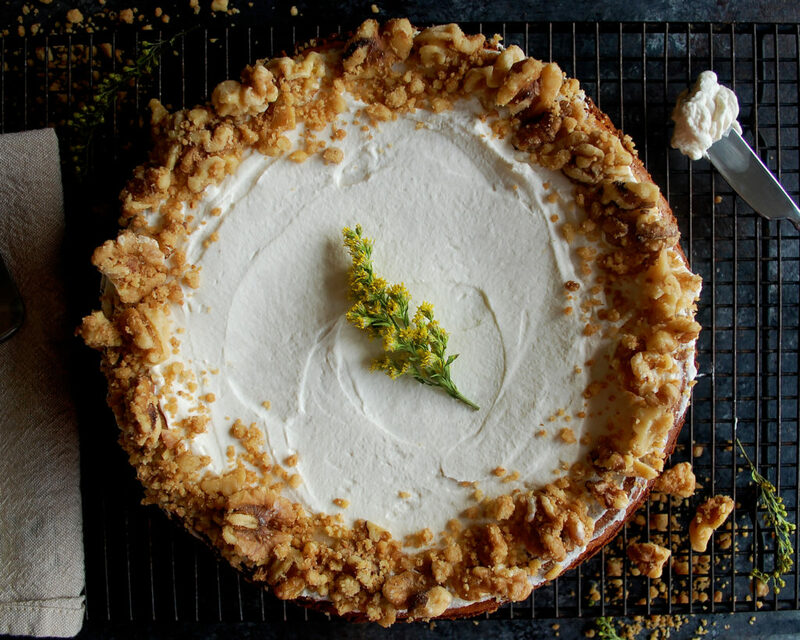 I am pretty biased to any type of shortbread (flour + sugar + butter), and this walnut streusel crust is basically just a walnut shortbread. 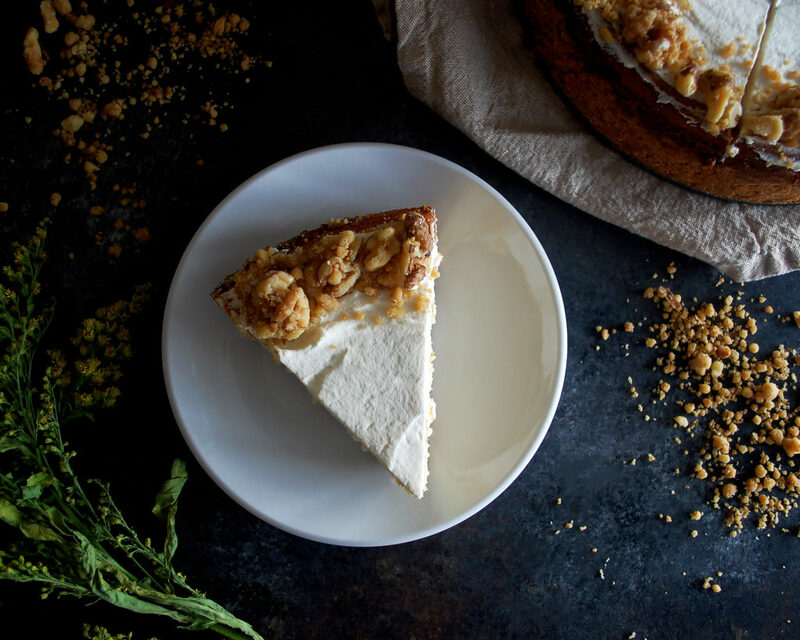 The texture of it is so dense and buttery, and the walnuts add some extra texture plus a wonderful nutty flavor. It’s the perfect base for the cream cheese mixture, which is easy as anything to whip up. I add a little bit of the Irish cream straight into the mixture. The flavor isn’t too strong, but just enough to get that creamy, rich taste. 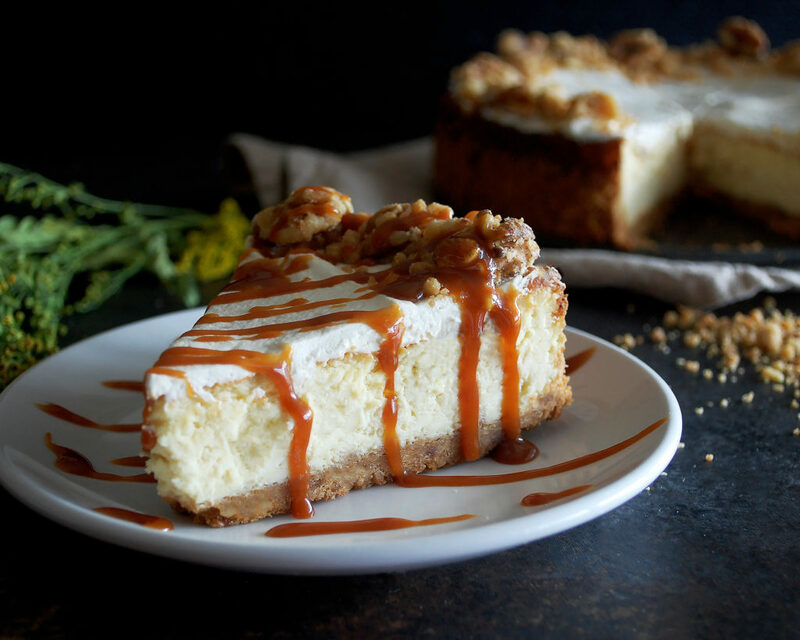 The key to making this cheesecake is baking it properly. I took my nana’s base recipe and doubled it so that the cheesecake layer was extra thick. That meant that I needed to adjust the cooking temperature and time (I tested 3 different cheesecakes before getting this right). The magic combo ended up being 300 degrees for almost 2 hours in a water bath. The water bath was crucial for cooking the cheesecake evenly and preventing it from curdling. In order to make sure the water from the water bath doesn’t leak through the spring-form pan and make the crust soggy, simply wrap the bottom half of the pan with a layer of plastic wrap and then a layer of foil. That will keep the crust crisp and the cheesecake perfectly cooked. Once the cheesecake is cooled, I spread a thin layer of Irish whipped cream on top. I then add a walnut streusel crumble around the edge. 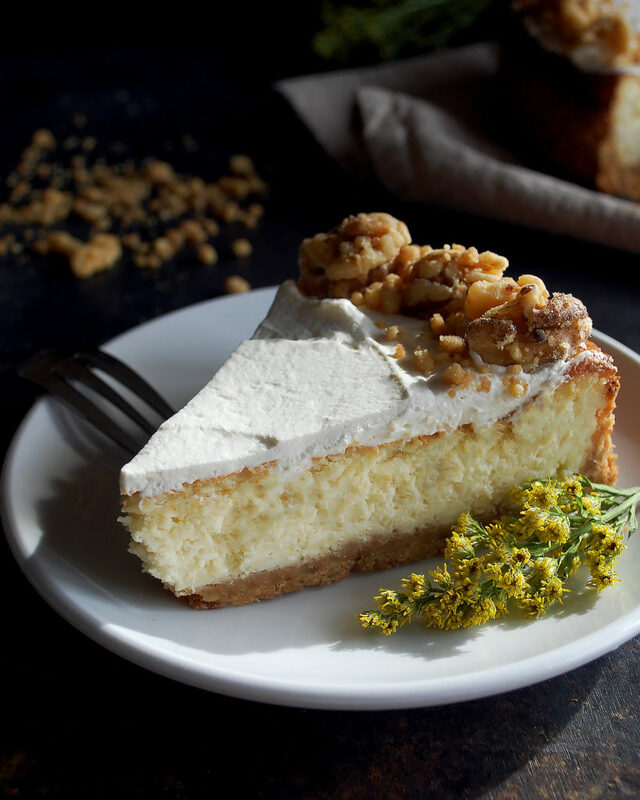 I make this just by taking some of the leftover raw crust, crumbling it up, adding a few larger walnuts, and baking it until it’s golden brown. It’s the PERFECT topping. And to make it more special, I make a quick caramel to drizzle over the top. Super easy and gives it a great look. Enjoy! Preheat the oven to 375F. Combine the brown sugar, chopped walnuts, and flour in a large bowl, mixing well. Stir in the melted butter until the mixture is evenly incorporated and the flour has been absorbed. Grease a 9” spring form pan with butter. Add ¾ of the walnut streusel to the pan, reserving the remaining. 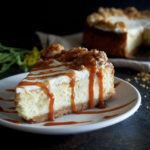 Press the streusel down so that it creates an even layer on the bottom of the pan, continuing to press up the sides to form a 1 ½” edge of crust. Make sure the crust is patted down compactly and evenly. Bake the crust for 10 minutes. Let cool slightly. 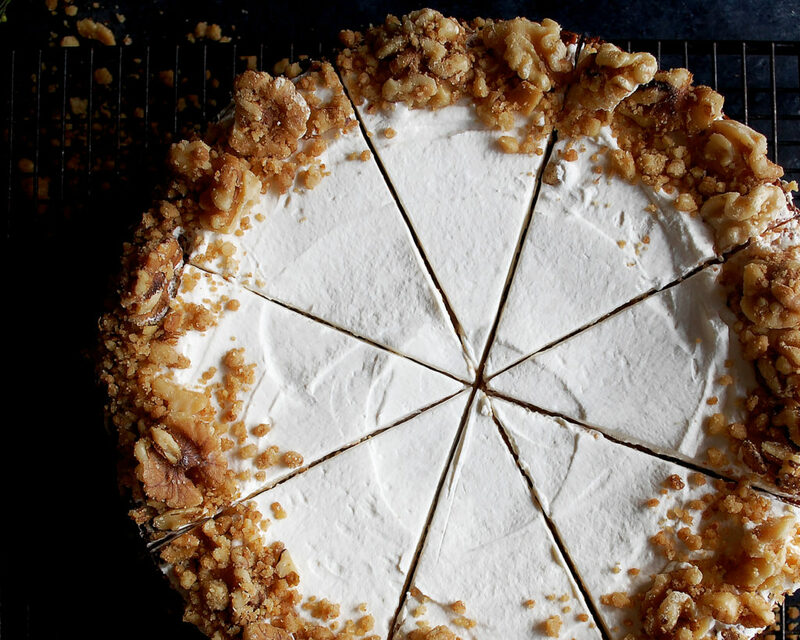 Spread the remaining streusel onto a baking sheet. Sprinkle the halved walnuts over top. Bake for about 6 minutes until the streusel and nuts are golden brown and the streusel is slightly crunchy. Remove from the baking sheet, spread into one layer, and let cool. Meanwhile, combine the eggs and sugar in a stand mixing bowl and mix well on high speed, using the paddle attachment. Add the softened cream cheese. Mix on high speed to incorporate. Lastly, mix in the Irish cream and vanilla extract. Pour the cream cheese mixture into the cooled crust. Wrap the bottom of the spring form pan first with plastic wrap and then with a layer of aluminum foil (just high enough to seal the bottom edges, not to cover the cheesecake). Place the pan in a water bath (see notes) and bake at 300F for about 1 ½ – 2 hours. Test the doneness of the cheesecake by inserting a toothpick into the center. It should come out reasonably dry. The cheesecake should also feel firm to the touch, not jiggly. Use a small knife to loosen the sides, running the knife all the way around the edge. Remove the sides of the spring-form pan. Let the cheesecake cool completely. In a stand mixer, whip the cream until it reaches soft peaks. Add the sugar and Irish cream. Scrape down the sides. Mix again until fully incorporated. Be careful not to overmix. Spread the whipped cream in an even layer on top of the cheesecake. Heat the cream over low eat in a small sauce pan. Combine the sugar and water in a sauté pan. Heat over high heat until dissolved and bubbling (do not stir). Continue to cook until most of the water has evaporated and the color is dark amber. Turn off the heat. Whisk in the heated cream very carefully. Return to medium heat and cook until thick and glossy. Stir in a pinch of salt. Slice the cheesecake into 8 slices. Sprinkle the cooked walnut streusel around the edges. Drizzle the caramel over the top. Serve chilled or at room temperature. To cook in a “water bath”, place your spring-form pan in a larger baking dish. Make sure the bottom of the pan has been wrapped with plastic wrap and foil. Fill the larger baking dish with boiling hot water so that it comes about ½ way up the spring-form pan. Put the entire baking dish in the oven to bake. The water helps the cheesecake cook evenly and prevents curdling.